Wondering what’s going on in the photo below? 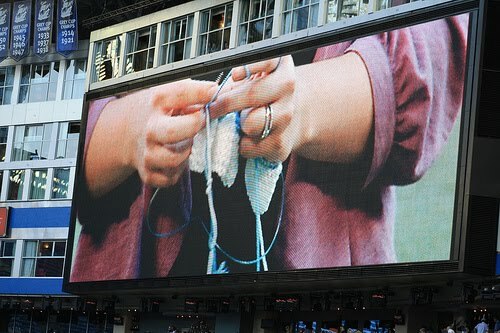 Well… that is a knitter on the “jumbotron” at a Major League Baseball game. 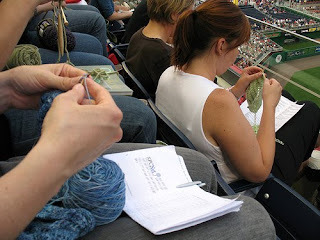 This unusual knitting/crocheting/needle-crafts event is being held all over the country at baseball stadiums. Basically, it’s just a (LARGE) group of needle-arts addicted people who travel to the ballparks for an exciting game and yes, some knitting. The event is called “Stitch N’ Pitch.” We are happy to announce there’s an event coming to the Pacific Northwest! On Thursday July 14th, Stitch N’ Pitch will be happening at the Seattle Mariners game at Safeco Field. So here is your chance to experience a major league game and not have to put down your knitting project. A local group is being organized by Lantern Moon (the knitting needle and accessories company) in Portland. They are taking reservations for a bus trip which includes a ride up and back to the game, tickets, and a goodie bag. Cost is $60.00. Space is limited. Contact them via the link below. 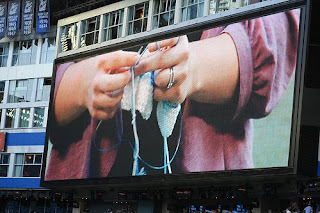 We think this sounds like an awesome event and we can’t wait to hear what it was actually like in the ballpark with hundreds (maybe thousands) of knit and crochet folks in attendance. The post Stitch N’ Pitch 2011 appeared first on Knit Purl Blog.